La crisi. L’ho prevista nel 2001! Nel mio libro “Dove andrà a finire l’economia dei ricchi?” edito da Malatempora nel marzo 2001, spiegavo gli effetti perversi della crescita dei derivati e già prevedevo la crisi di oggi! Questo è l’estratto dei capitoli da 4 a 7 del mio libro. Dopo qualche anno di pausa sono di nuovo online. Nel frattempo è arrivata la grande crisi… che avevo grà previsto quasi dieci anni fa! Crisi che rende attualissima, come non mai, la mia teoria economica. Per questo motivo ho deciso, usando le potenzialità offerte dai video su YouTube di riprendere la mia attività di divulgazione sull’economia del debito e sulla possibile alternativa, un economia dell’abbondanza. Quelli elencati qui di seguito saranno i temi affrontati nel corso. Per ciascun tema potranno essere necessari più di un video. La cadenza dei video sarà all’incirca mensile. An introduction to my lectures on debt based economy criticism. To discuss these matters in more depth, I made some video conferences you can watch on my blog. An unprecedented financial crisis is turning the world of economy, finance, banks, businesses, governments, but especially our lives, upside down. Do you want to know the truth about this financial crisis? Look me straight in the eyes and search your soul…do you really want to know the truth? It will probably demolish most of the certainties you’ve based your life on so far. It’s about abandoning the prejudices and mental habits that have helped you interpret the world. Good, if you’re still here it means we can leave…oh yes, because it’s about taking a journey, much like any quest for knowledge, and to take a journey you need a ticket. Here you go, I’ve got two right here: Oh don’t worry about the cost… both companies are very generous and have virtually unlimited assets so the ticket is free. One of the tickets will take you to Hell and the other goes to Paradise. Alt! Let’s not start with prejudices! Before you decide which one to use, let’s see what heaven and hell mean in the economic and financial sector. Financial institutions, governments, and most accredited observers attribute this crisis to the default of many derivative financial products. In other words, someone gets into debt, doesn’t pay nor, presumably, will ever pay, and the instrument that represents this credit is no longer worth the paper it’s written on. In theory, derivatives are zero amount products: if someone bets that a certain title will go up, someone else will bet that it will go down. Whatever actually happens determines who wins and who looses. As I wrote over ten years ago in one of my first books on this subject, in contrast to the general opinion of observers, this doesn’t actually happen in the real world, and recent events are proving me right. This problem is aggravated by the fact that financial markets have constructed a series of “packages” containing good and bad instruments: at the moment, this means it only takes one element in the package to be in default at maturity to make the whole package go bad. You’d think we should break down the packages and weed out the bad instruments but it isn’t easy. It’s basically impossible given the dimensions of the problem. Even the most expert financial operators aren’t able to distinguish the destination and content of the bonds in these packages. The moral of the story is: no one actually knows how many of these instruments will be in default and, above all, no one knows when this will happen. The current estimate is that about 40 trillion dollars worth of derivatives will default. The number of derivative instruments is extremely high. Data from the Bank of International Settlements for the third quarter of 2008 reports a total of 407 trillion dollars for traded derivatives on the Stock Exchange and 863 trillion dollars for Over the Counter derivatives, which gives a total of 1,270 trillion dollars. Please note that the world GDP, meaning the value of all the economic activities of the world’s inhabitants, barely reached 57 trillion dollars in 2008. In other words, the amount of derivatives is equivalent to 22 times the value of all of our work. Basically, it’s time to pull up your sleeves and start thinking about donating a consistent part of your income to pay someone else’s debt in order to save this financial world: If the estimated default of only 40 trillion is correct, all we need is for everyone in the world to make an effort for about a year and give up basically everything they earn to cover this debt. Right, because the resources that the American government has managed to collect to cover the hole, following hard battles in [Parliament – Congress and Senate], amount to about one trillion dollars, so that leaves at least another thirty nine to pay back. But if the pessimists are right, and if the hole is actually a lot larger, and if the entire derivatives system is on the verge of collapse, it could take two or three years, maybe even twenty two. Please, do sit down. Because I decided a long time ago to flee this crazy world and to think about wealth in other terms. We will see what a derivative actually is later on during our journey. At this point all I want to say is that the fact that in one quarter there can be financial instruments that are worth multiples of annual world production is a little strange, and we’re only talking about a portion of all the financial instruments in the world. So, to cover this default, you will all have to work for years on end for the exclusive purpose of paying back this debt. This concept is so absurd, if you think about it, that it would almost be funny, if the consequences of this little story weren’t so dramatic for tens or hundreds of millions of people in the world. I believe that this is the clearest demonstration of the fact that something isn’t working in the mechanism of the financial system, and I’ll tell you straight away that the thing that isn’t working is debt, the logic of debt. It’s the fact that this system is founded on a mechanism of wealth creation based on debt. Furthermore, it’s the fact that this debt will necessarily always increase and cannot do otherwise. And by increasing, it determines power relationships and transfers of power that have nothing to do with a democratic and open society. Do you know what happened this Christmas? Well, every year we celebrate the birth of Jesus and, well, it’s a special day up there. And this year, what with the financial crisis and conflict in Palestine the matter received special attention. So Jesus’ mother suddenly remembered that she’d received a loan on the day her son was born and she’d forgotten to repay it. A banker of that time had generously granted her a loan to buy the nappy that covers our lord’s pudenda in all our representations of the nativity. Oh, it wasn’t a large amount, about the equivalent current value of a cent of a Euro, but Jesus’ parents were so poor at the time that they didn’t even have that much to spend. After the birth, you know how it went: Herod, the massacre of the innocents, the flight into Egypt, then this little boy started running away all over the place, getting angry at the merchants in the temple and the Pharisees, followed by the dramatic and glorious epilogue…as a result the Virgin Mary had forgotten all about the loan. So she decided to return to Earth to pay it back, she could hardly let such a misdeed ruin her reputation. She had some savings: of course the Virgin Mary had incurred some costs for travel and apparition expenses, Medjugore, Fatima, Lourdes and many other places in the world, but she is generally a prudent spender and one doesn’t have many occasions to spend money in Heaven. She fetched her cheque book and credit card and sought out the descendants of the banker who had granted her the loan all those years ago. She had no trouble finding them and she asked them if she could settle her debt. Of course, there was interest to pay, but the rate was quite reasonable: only 4% per year and annual capitalisation. After a while, the banker’s descendants presented her with the bill: the mother of Jesus started to look back over the milestones in the history of the Church, and the Virgin Mary began to worry when she saw that her debt had reached 2,145 Euros on the day Constantine had won over Massentium, not to mention over 423 billion Euros on the day Charlemagne was crowned. Then the numbers became too long to read and she realised that she would have trouble paying back the loan: Do you have any idea of the interest one cent of a Euro accrues in 2008 years? I won’t tell you the amount because I can’t pronounce it and I doubt anyone could. I’ll translate it by giving an example of what that sum means. The current price of gold is about 20 Euros per gram, but the number becomes incomprehensible when you express it in tons. However, we know that the Earth weighs about 5976 millions of millions of millions of tons, so if we divide the number we have by the weight of the Earth, we can say that, in order to pay her debt, the Virgin Mary would have had to pay 13,350.72 balls of gold, each one the weight of the Earth, and that her annual interest had reached 493.74 balls of gold, each one the weight of the Earth. Doesn’t this all seem a little crazy? Such is the perverse mechanism of interest. One cent of a Euro, over a long period of time compared to a single human life, but an extremely short period compared to the history of the world and human civilisation, can become an amount so high that it has lost all contact with reality. What we are considering at the moment isn’t the interest compared to the life of a single human being, but the effects of the logic of interest compared to the life of our civilisation, in which finance is based, to be precise, on the logic of debt. So now you understand why derivatives, which are an expression of this mechanism, can reach the value of twenty two times the total of all human activity. You understand why this system has become absolutely impossible to manage and that the logic of debt is actually infernal. In fact, this is Hell, and we will have to cross it to reach Heaven like novice followers of Dante in the quest for our Beatrice, for the happiness of a society freed from this absurd nightmare. Heaven, in fact, is a world in which everyone can have what they need because there are plenty of resources to satisfy everyone, where every citizen receives a citizenship income sufficient to provide for a decent standard of living, and this amount doesn’t depend on earnings, social condition or employment, since it represents every human being’s right to life. Furthermore, this Citizenship Income doesn’t replace the earnings each one can produce with work, so some may choose to gain wealth if they wish to do so, and some may opt for activities that don’t lead to economic gain but maybe to spiritual, artistic or social enrichment. Because equality doesn’t mean that everyone should earn the same, no, but that everyone has the same possibilities to develop their talent. It’s a world without interest and without debt, in which whoever wishes to undertake something may do so without conditions and without fear of being blackmailed. It’s a world in which productive forces are truly free to demonstrate all their potential for the good of humanity and for the good of each individual. Because no one ever said that egotistic interests necessarily contradict the pursuit of the common good, except in the logic of scarcity which constituted the logical basis of the debt economy. 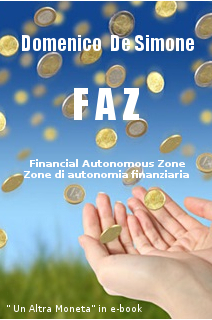 I’ve called this society FAZ – Financial Autonomous Zone – and it is founded on the logic of abundance. This is the breakthrough: We must overturn our way of thinking and enter the logic of abundance, of overproduction and the society of the immaterial. We must refuse the prospective of dying of hunger due to over production, as Bochaca, an economist, wrote in the thirties. So we’ll have to use both tickets, as our journey starts in today’s Hell. To try and understand how the society of debt and scarcity was born, and how it is possible to leave it behind to find the society of abundance and creativity.